I started my journey into the wild a few months ago when I became curious about wild rice because it checks all the boxes for something to put on the planned buying list; lightweight, non-perishable, high nutrition and delicious. I quickly learned that this little grain is not a rice at all and that most of the wild rice on the market is cultivated, so it isn’t really very wild either. Instead, wild rice is an aquatic grass with 3 varieties native to different parts of North America and bonus fact, wild rice is North America’s only native cereal grain. Nearly all of the commercially available wild rice on the market is the cultivated variety with a tougher, glossier sheath. It is grown in man-made paddies that are first flooded and later drained for mechanical harvesting. But there is some wild rice on the market that is truly wild, self seeding and hand harvested from natural lakes as it has been for at a couple thousand years in Lake Superior area of Minnesota. Currently this truly wild rice sells for around three times the price of the farmed varieties. I found many examples of both cultivated and truly wild rice online and because of the price difference, wanted to do a comparison. Before purchasing though, I took advantage of a local foodie connection and reached out to a friend in northern Minnesota to see which brands she trusted only to learn she buys local and direct, getting her supply of truly wild rice from the hand-harvester. While she had no advice to offer on commercially available brands, she did generously offer to share some of hers*. I ended up purchasing a 1 lb. bag of each to try and as far as cooking goes, the truly wild version cooks in about 1/2 the time (30 mins) of the cultivated variety. They have both been prepared in plain water and water+chicken broth. Both were delicious when served hot with a little butter, reheated and served cold, tossed in salads and fajitas for extra protein and fiber. 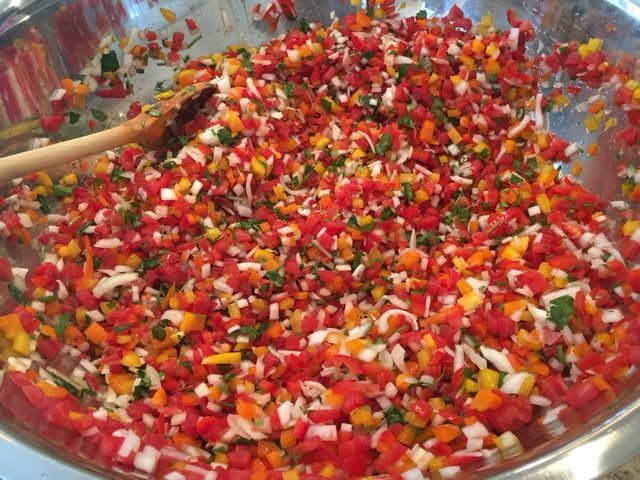 Since it is so flexible, I make double and triple batches to have cooked rice on hand throughout the week. The first few times I made it I used the standard stove top method. But then I tried the Anson Mills technique and the results were beyond compare. This involves straining the rice just before it is done, spreading out in a shallow pan and placing in a warm oven to dry for 5 minutes then patting with butter and serving. Whether truly wild or cultivated wild, I think this grass grain is on my table to stay! * The wild rice pictured at the top of this post is some of the truly wild rice my northern Minnesota friend shared from her personal stash with me. The sheath is not the uniform mahogany of the cultivated variety and gives away its grassy nature. I am not sure which method was used to dry/parch this wild rice versus the varieties I have purchased, but that may have played into the cooked result. My 11 year old who knows nothing of the provenance of any of the wild rice that has been a staple on our table for the past few months declared this wild rice to be the best we have made. It has rained all day, every day for a week now and the sky has run itself out of water! I stole this break in the rain to check on sown seeds and the herbs and berries. The back half of this box is mixed lettuces and the front left is daikon radishes. The front right is leftover bibb lettuce from a Victory Garden project at my son’s school. The tomatoes and peppers are hardened off and ready to be planted in the beds. I have my own saved seed serranos as well as an heirloom yellow pepper this year and for tomatoes I am growing an heirloom grape tomato and trying my first F1 hybrid for a red slicing to improve yield. The blueberries are trying to live up to their names with a hint of purple starting to stand out against the green. The sage flowers have been a favorite of visiting bees but are ready for their spring pruning now. The chives are also sporting lovely dead head flowers and at last they seem to be truly established in my garden. The last frost date for this area passed without incident on April 9th and today was my first day home to survey the perennials and sow some annuals. I’m just going to say it, my over-wintered herb garden is just darned pretty this spring. And I am beside myself that the chives are not just alive but thriving! After years of refusing to grow for me, they are vigorous and even blooming. 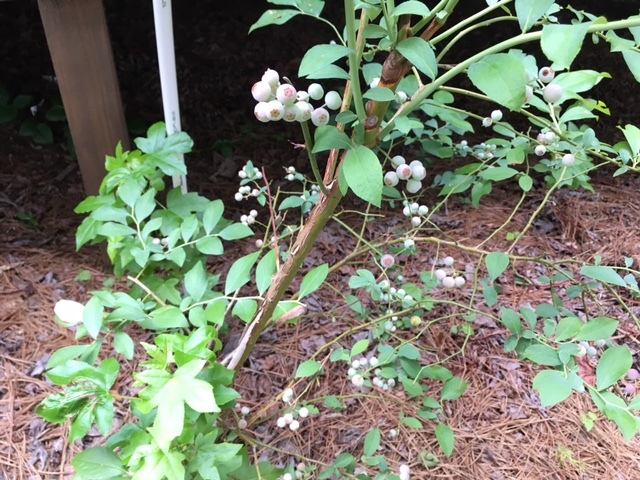 I was also ecstatic to see the blueberries bountifully in bloom! Last year the blueberries were conned into blooming by the false spring and a hard, late frost killed most of the flowers. A feeble second bloom happened after the last frost but didn’t amount to much. 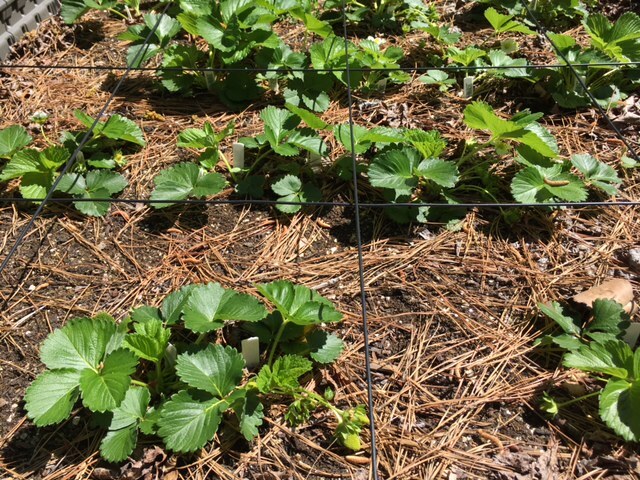 The strawberries were also a pleasant surprise, not just sporting a healthy head of blooms but some hard green strawberries already just waiting for the warmth of the sun to make them blush. I threw caution to the wind a few weeks ago and mixed up the assorted lettuce seeds I had on hand and sowed them thickly in 1/2 of a bed. I love the mix of the reds, greens and the little ones already wearing speckles. 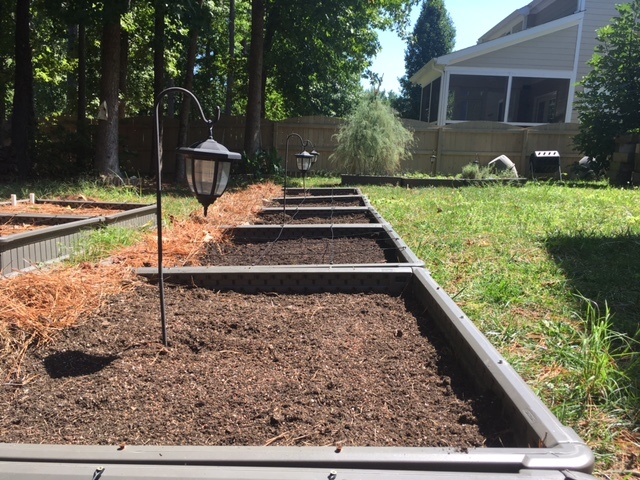 And lastly I laid down 18 rows of spinach in the front 3/4ths of these beds that will also host 2 tomato plants each in a few weeks. Ahhhhh…the gardener’s Spring has finally spring! Winter is a quiet time for the garden. The cooler temperatures and shorter days signal a change and the earth changes orientation from growth to conservation. The plants that continue to grow through the changing of the calendar year do so at a pace that resembles drowsy, hibernating animals. It is a necessary fallow season. A time to rest and restore between the endeavors of growing seasons. This is true for both garden and gardener. These were the thoughts turning over in my head yesterday as I tidied up the asparagus and herb beds, tucking them in for winter. 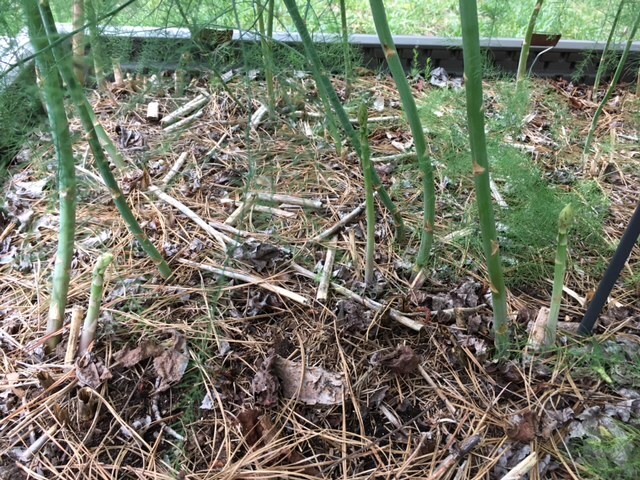 I let the asparagus go each year until there is no green left then compost the stalks and hand mulch the dried Sweet Gumball leaves that have fallen in the bed to give them a head start on breaking down into rich leaf mold. The herbs had overgrown in the last flush of fall so I corralled them to their respective sections with clippers and kept some nice sprigs of thyme, oregano and parsley for tonight’s soup. 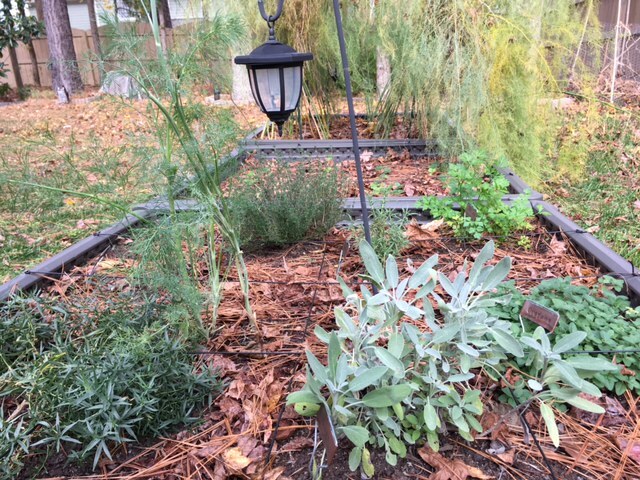 Visually the thyme and the rosemary blend together both in person and photos so I think I will swap out the fast growing parsley and thyme next spring and let the rosemary continue to grow in the center of the bed. All that remains to close out my 2017 garden is to give the figs a much needed pruning and trim back the blueberry bushes a bit. It has been a quiet time for my garden and blog with the time normally spent growing, cooking and writing instead going to other endeavors this year. There is a little more time between now and spring temps here in the south. The last bit of the fallow season, with weeks that can be counted on hands now. My 2018 seed catalog has arrived and I am beginning to plan for the renewal. It is the end of an unusually quiet summer here at NHG. A late, hard frost wiped out much of the spring plantings as well as this year’s harvest of blueberries and asparagus. The figs and asparagus were late and modest. 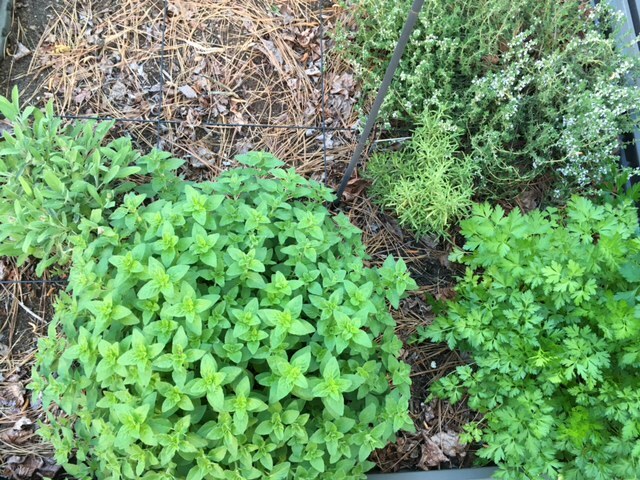 Only the herbs were undaunted by the hard freezes and have flourished their second year in their permanent bed. They have flowered and dropped seed which I hope will refresh the herb bed regularly by being able to remove the mother plants every year and allowing the next generation to take a turn. 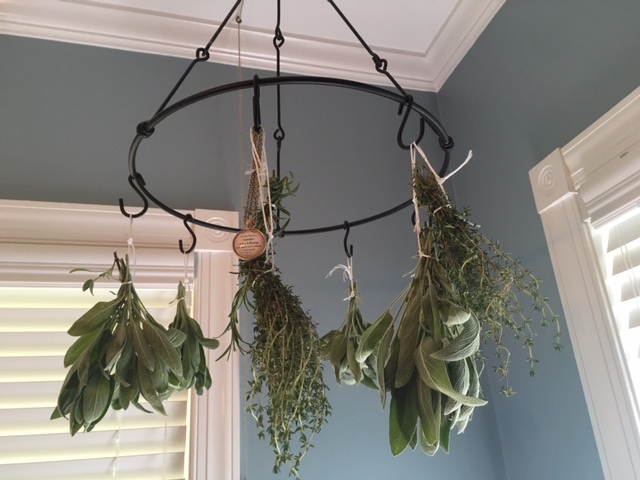 So today I began closing summer, deadheading the spent flowers and trimming back the herbs for drying. I also began the opening of fall today. 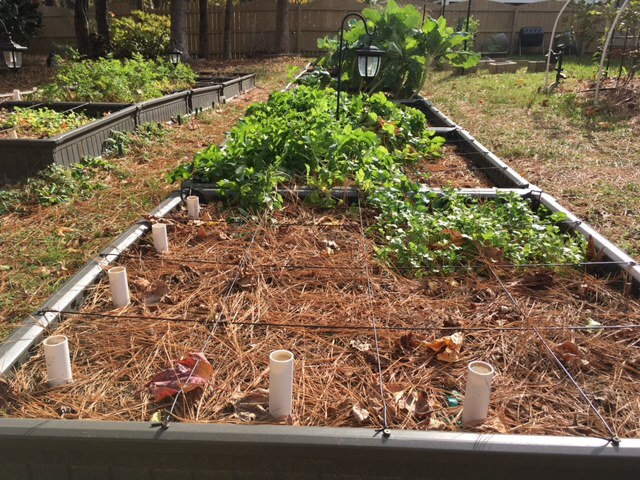 Planting beds with radishes, spinach and cilantro then lightly recovering the seeds with the pine needle mulch that is a naturally occurring phenomena in my garden. Here’s to a fruitful autumn! Start with a good variety of fruits, berries and herbs that pretty much take care of themselves year after year. Add to that background of growth, some tender green leaves (lettuce and spinach will do nicely) and one hungry rabbit. Voila! You are back to your permaculture staple of fruits, berries and herbs with no pesky greens to worry about. This, in a nutshell, is my summer. 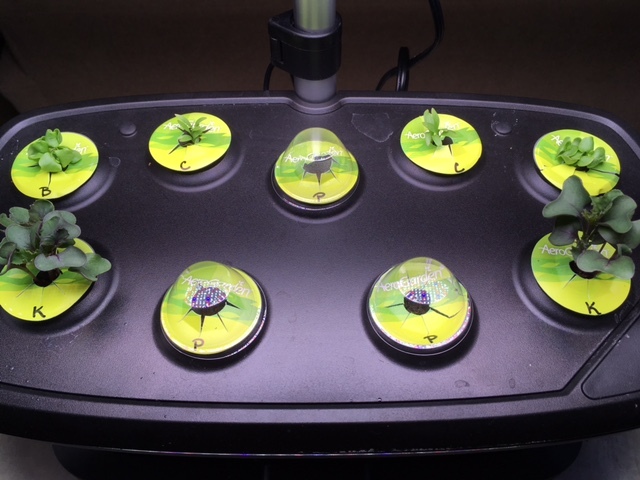 The herbs bolted and are setting seed now. The strawberries are producing well but I haven’t covered the bed so the birds are beating me to many of the berries. 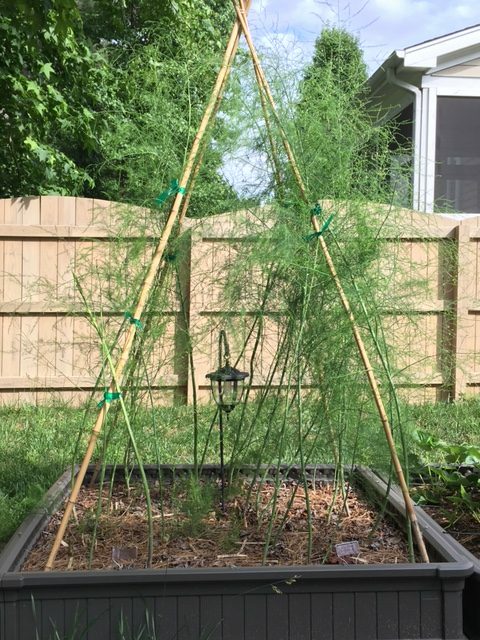 The tower of asparagus is holding up very nicely under the accumulating mass of growth and the asparagus themselves are inexplicably sending up sporadic spears (3 in the pic below). 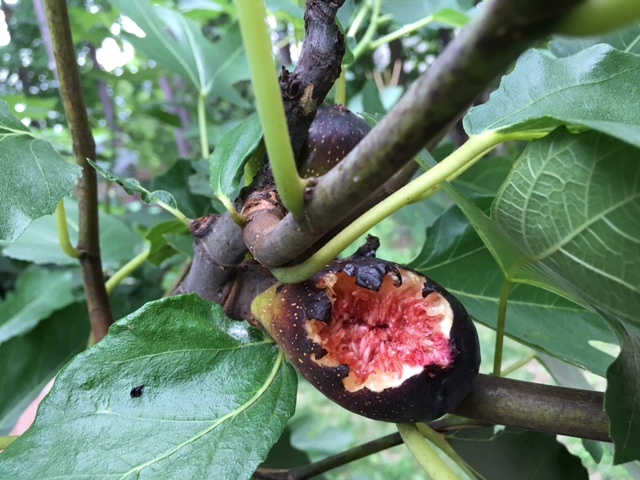 The figs are plentiful and beginning to ripen. The birds also beat me to the first fig of the year but they don’t seem to have seen the one on the other side yet. 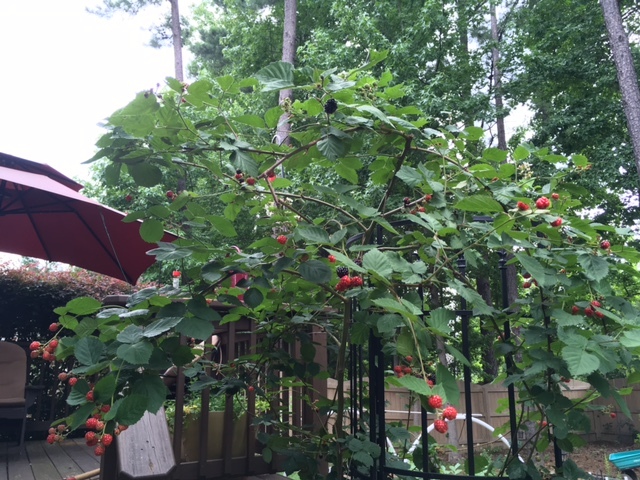 The blackberries are ripening by the handful daily and the blueberries are plentiful, but stubbornly green. The rabbit problem appears to be solved so now I am just patiently waiting for August when I can plant more greens for fall. After an early, false spring in February that fooled blueberries and peaches into blooming followed by the rest of a perfectly normal winter that felt like it lasted forever, spring finally did come and then go in a flash and we are now fully into summer in Zone 7b. My asparagus harvest was light this year, which I attribute to the early burst in February, with many spears freezing at the end of the false spring. I don’t know if the freeze affected the crowns or if it was just a coincidence. An interesting side note, for each of the last two years I have had a second burst of spears in fall when nighttime temps dip into the 40s. It will be interesting to see if I do and how much it produces this year. In the meantime, each of the crowns has a few spears that have been allowed to grow tall and fern-like. Every summer I try something a little different to contain all this greenery that feeds the crown for next year’s harvest and each year the greenery either slowly or not so slowly overtakes my supports. I think I may have won this year with this 4 pole support, similar to what I have used for snap peas on a larger scale. Currently the asparagus are around 5 1/2 feet tall and being easily supported. The herbs that overwintered are in full flower, some so prodigiously that I trimmed them back to allow everyone a little sun and space. While I wait for the blackberries and blue berries to ripen, my favorite summer treat this year is free-stone peaches halved and grilled for 4 minutes per side. They are a perfect addition anything you are serving up! The threat of winter weather pushed right up to the last frost date for my area this year. Add in my hectic schedule the past few weeks and the result is a late start on my spring garden, and some corners looking to be cut. 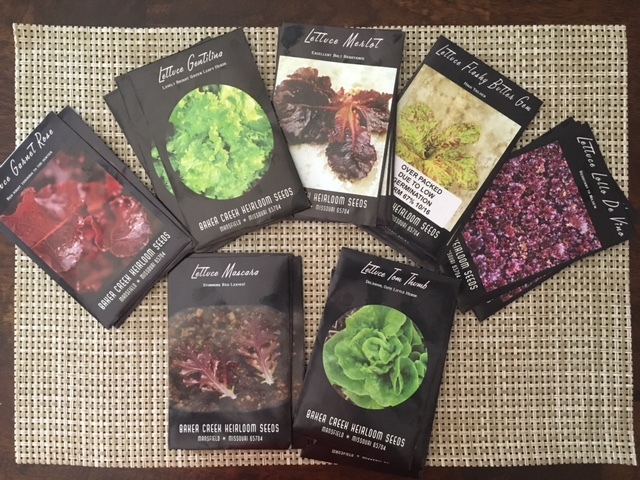 These colorful lettuce varieties would normally be carefully planned and planted in their own distinct areas. This year I am deploying what I am calling a laissez-faire farming method of “mixed lettuces” saving a lot of time and proving that even lackadaisical farming sounds better in french. Seeding and watering these 9 square feet (around 100 plants) was the work of 5 minutes. I have to give a quick shout out to the oregano photo bombing the picture above (bottom and right of garden bed). This now feral oregano self seeded the area around it two years ago when I had the herb planted in this box. It is so thick and lovely year round that I am tempted to use it as a ground cover along paths. 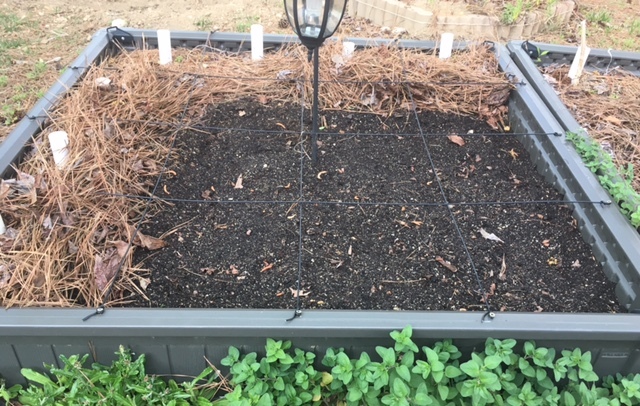 For the rest of my garden, this year I am doing a lot more grouping than normal, with all of a bed planted with spinach or radishes or edamame, allowing me to broadcast seeds and get everything started a little faster. The average last frost date for this area passed on April 4th but it has been an unusual spring with early season warming trends in February that encouraged strawberries and blueberries to bloom early followed by unsurprising freezes in early March that played havoc with the plants. My strawberry blooms mostly survived the hard freezes in March and these June Bearers are already showing off green fruits. 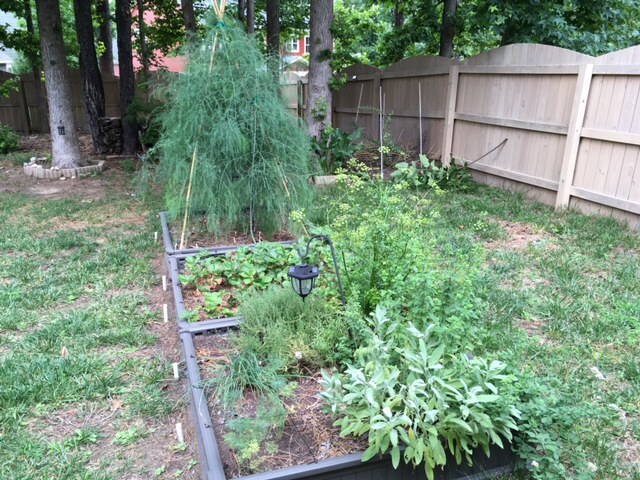 The permaculture herb garden did very well over the winter, only dill and tarragon did not survive. 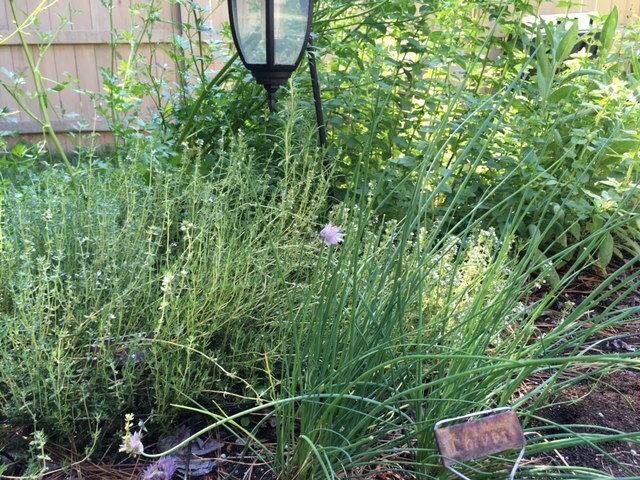 The thyme is already blooming and the sage is just a step behind. 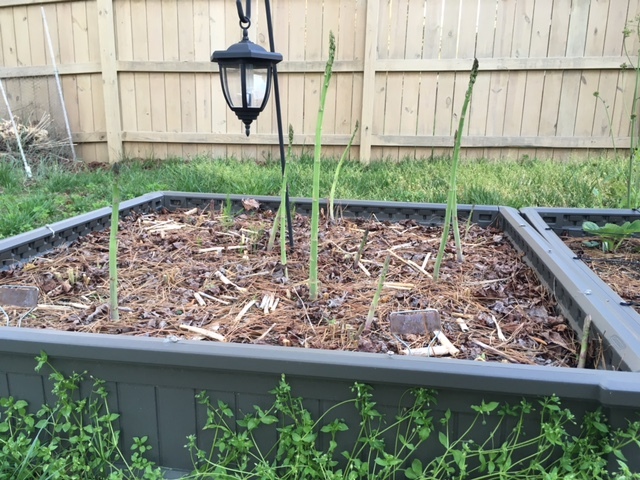 Several asparagus spears were harvested in February then several more killed by one of the hard freezes, but they are loving the current weather and I am harvesting 5-7 spears every 2 days right now. I lost some blueberry blooms with the freezes, but they also seem to have rebounded more or less with new blooms coming in, though I anticipate a diminished harvest this year over last. Spring seems to be here to stay at last so it is time to start planting some annuals too! This headline “First U.S. Bumblebee Officially Listed as Endangered” in a National Geographic article last week says it all. This is the first US bumblebee, but not the first US bee. Seven species of Hawaiian bees were declared protected under the Endangered Species Act last year. 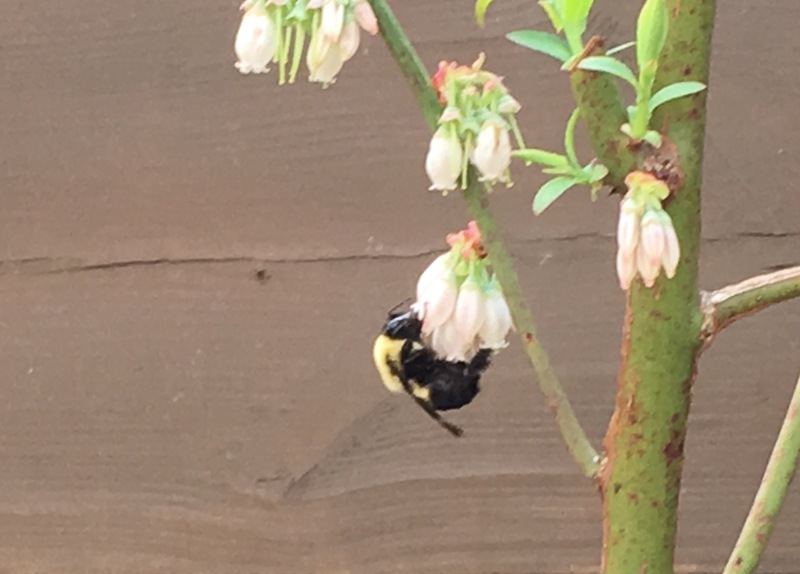 I happened to see this one buzzing through my blueberry bushes today and couldn’t resist a sentimental (albeit slighty grainy) pic in light of the news. One of my goals for the coming months is to find lessons for skills I want to either learn or improve upon. 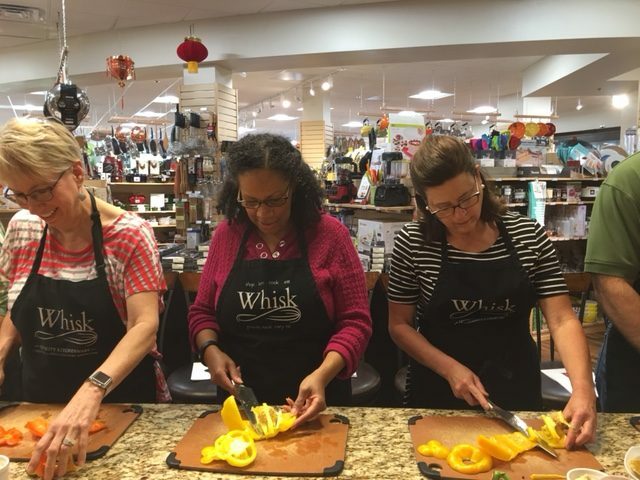 I had a head start a few weeks ago with a class offering by Whisk, a unique, local kitchen-everything shop in Cary (more about them in a bit). 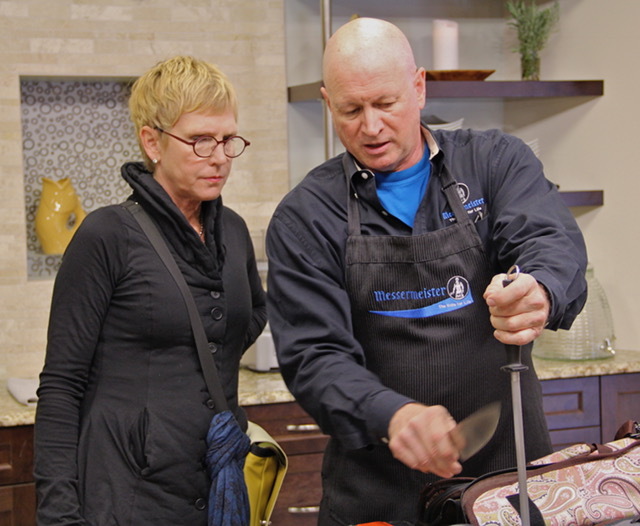 The class was Mastering Knife Skills, a two hour, hands on lesson taught by Ethan Hamme from the Messermeister company who was both knowledgeable and entertaining. The photos that follow are from another class Ethan taught and were generously provided by Whisk for my use here. One of my biggest take aways of the night was at the beginning of class when Ethan shared his thoughts on honing. You either get into the habit of doing it before you use the knife each time or you get into the habit of doing it after. He thinks it is easier to do it before, making it a step in the mise en place and therefore more likely to be remembered. 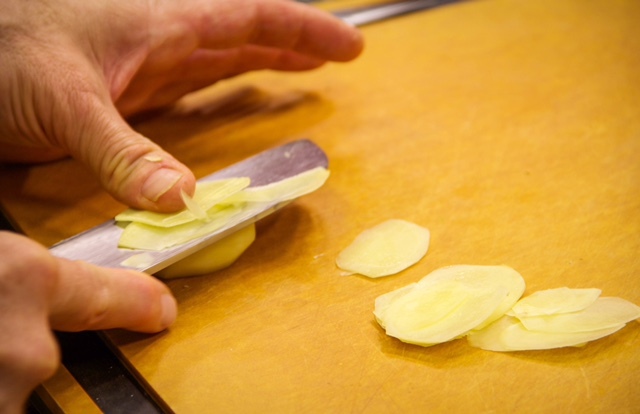 The class was focused in particular on the chefs knife and its uses. We first learned proper grip and then dove right into different techniques for different vegetables. I am sure I could have found my way through my first julienne watching a YouTube video, but now I have actually done it. We then cut the julienne down to a fine dice called brunoise. An interesting component of the class was the assortment of chefs knives on the table. This afforded students the rare opportunity of taking different knives out for a test drive throughout the class and see what felt good in their hand. At the end of class I had to wait in line behind other students to check out with my two new chef/paring knives sets, so it looks like a win-win for students and store. Whisk was just opening its doors in Cary when I moved to the area a little over three years ago. By luck, I briefly met Dan, one half of the husband and wife owners, when we both spoke at the same event so I have known about and visited their site many times and knew they held regular classes. I had even looked at the class listings a year or so ago and thought, “I will have to do that sometime”. And then a year went by. Let’s all make 2017 be our “sometime”! It is the day after Christmas and I wanted to peek at a couple of presents, patiently waiting their turn in the garden. 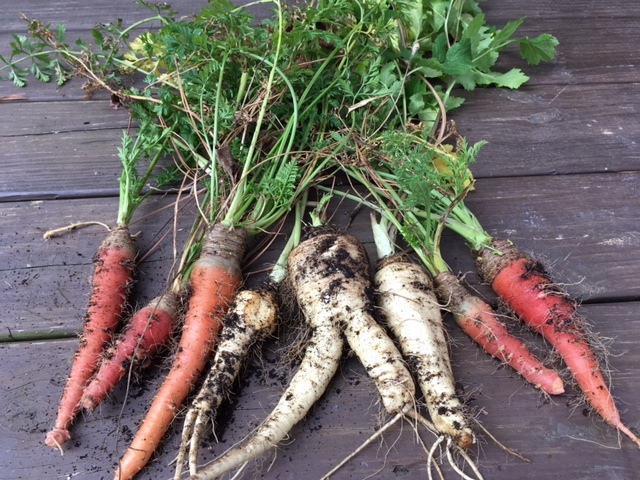 We have had a few light freezes in the Raleigh area and at least one hard freeze so far this winter so the parsnips and carrots should be busily converting the starches into sugars making them sweet and delicious. I pulled up a couple of volunteers to roast along with the leftovers for tonight’s meal and am pleased with the weight they have put on in the past 2 months. Taste Test to come! The Scarlet Kale in my counter top hydroponic system has been growing by leaps and bounds to the point that they are overshadowing the slower paced cilantro and parsley starts. 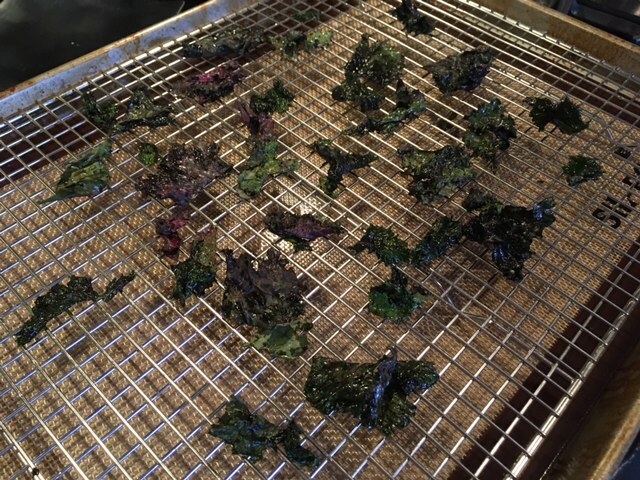 I needed to trim some leaves to let more light down to the smaller plants in the middle and a great excuse for kale chips. 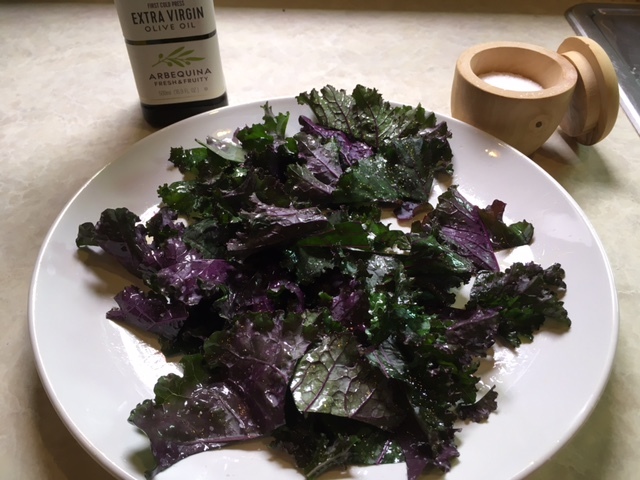 I use my hands to toss the rough chopped leaves with a little olive oil then sprinkle with salt (cayenne or any other spice you would like to add) and toss again. Cook at 350 on a parchment lined pan for until crispy and paper like, apx 10 minutes. I like to let mine cool on a rack for good air circulation and while I haven’t done side by side experiments, I think it keeps them crispier. 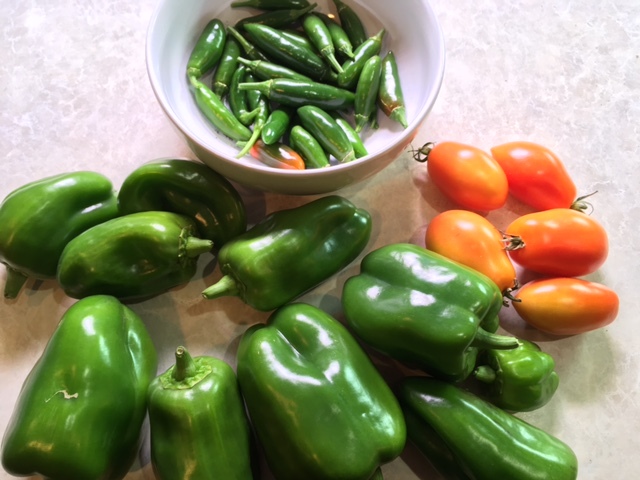 Autumn has arrived in North Carolina, bringing with it the final harvest of bell peppers, roma tomatoes and serrano peppers. The herb garden has brushed off the first few light freezes and stands ready to make meals fragrant and savory for months to come. I am confident that the thyme, oregano and sage will over winter well and hope that the french tarragon and parsley will also. 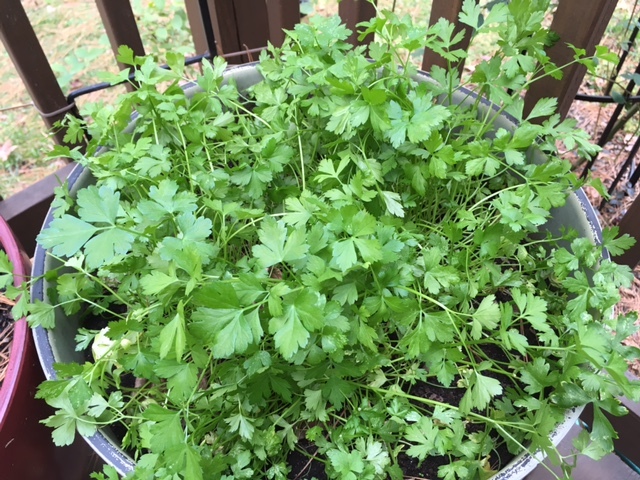 Parsley is such a staple of fall and winter dishes that I have more growing on my deck. I have been poaching from the deck parsley for a few weeks thinking that it would not handle the frosts as well, but so far it is also doing wonderfully. In previous years I have repeatedly removed pine needles from the garden beds only to replace it with a different mulch. This year I have come to my senses and am embracing the pine trees taking care of mulching for me. 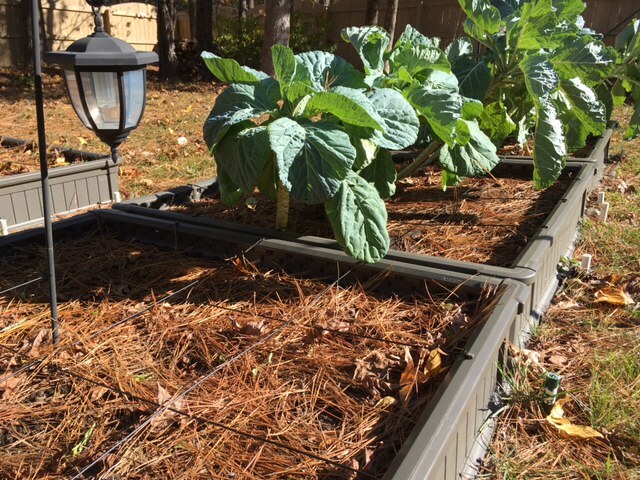 Collards, carrots, cabbage and parsnips are tucked into their naturally (and effortlessly) mulched beds. 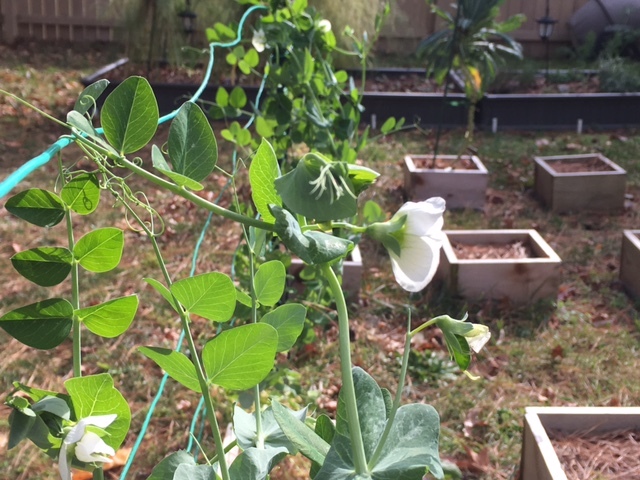 The fall planting of sugar snap peas has been supplying tender pea shoots and now has peas forming as well. 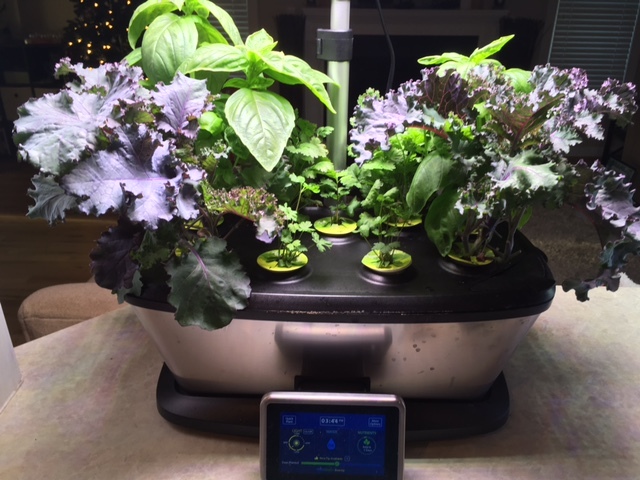 The hydroponic herbs were changed over 10 days ago to the varieties I know and love to cook with and are already doing quite well. 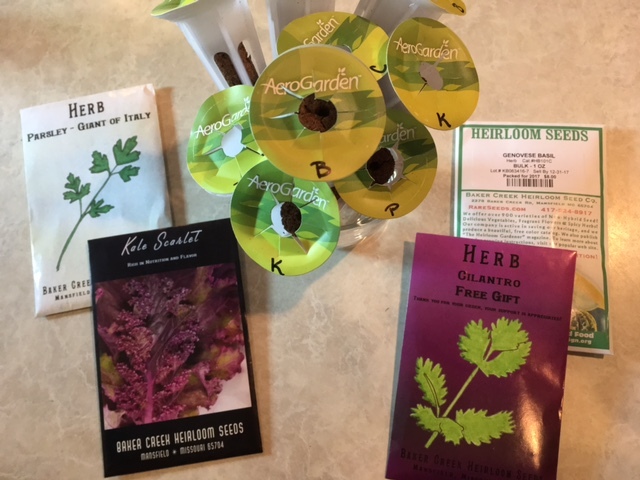 I am growing 2 plantings each of my favorite basils and cilantros, 3 of the flat leaf parsley and just for fun I am trying to grow 2 red kales hydroponically. With the Super Bowl and attendant tomato starts almost 2 months away, this cozy, fall garden that is mostly taking care of itself feels like a recess. 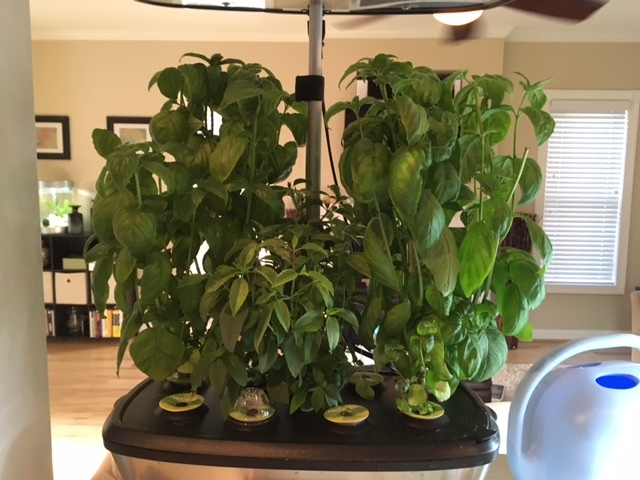 Day 46 of the prepackaged herb pack that came with my AeroBount and I have excellent basil growth, both genovese and thai. The mint was just starting to grow and the cilantro, parsley and chives never really took off. The genovese basil, while in the same family, is not the basil I usually grow. I do not know if it is a function of the variety or of the hydroponics but it bruises extremely easy and blackens quickly on warm dishes. 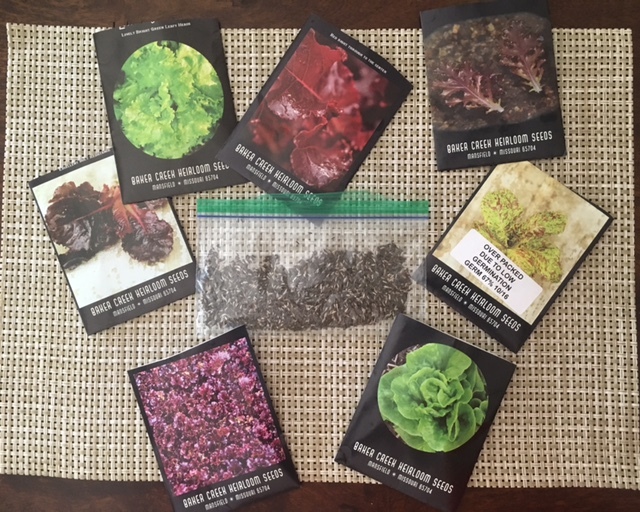 My Baker Creek order came in last week with seeds for my hydroponic herbs and counter top microgreens so I decided to ditch the prepackaged herbs and start my own this weekend. My aero garden has space for 9 pods so I planted 2 of each except for the parsley that I planted 3 pods of because fall stews + parsley = YUM!